Last week we made grilled pizza. Holy cow it was awesome! We rounded up our neighbors and everyone brought different toppings. I made the dough. The kids all played outside while we ate. No dirty dishes. No dirty carpets. Yummy pizza, perfect weather, and great friends. I was so inspired by Sunday Suppers and their posts on grilled pizza. They made it look effortless and elegant. I go for effortless but with a baby at my hip who is a master destroyer it's hard to be elegant. I do have fun though, and surprisingly it was easier than I anticipated. I made the dough and then separated into balls in a muffin tin. It made it easier to roll out individual sized pizzas. The grill needs to be hot, if you put your hand on top of the fire and you need to pull your hand back after 3 seconds than you know the grill is hot. Make sure your grill is well oiled so the dough won't stick. Put the rolled out dough right on top of the grill and then after 2-4 minutes flip it to the other side. Quickly put your toppings and close the grill for about a minute or two so that the cheese can melt. This week I'm undecided if I'll make pizza using a caste iron skillet or a muffin tin. I could just do the traditional in the oven cheese pizza, but where is the fun in that? Speaking of fun if you want F-U-N you have to check out this week's round-up of Project Food Blog. There are crazy pizza recipes like pizza on a stick, flag pizzas, sushi pizza, bimbimpap pizza, and deep dish cupcake pizza to name a few. Actually, to name 5 out of 72. I think food bloggers are the new crazy. Cute video! That looks like one awesome pizza party. And baby Maria is SO adorable! Grilled pizza is one of my absolute favorite things to make. I'm just sad that I don't have a grill out here in San Diego (and really am not allowed to have one either). Luckily, I think a few of my friends might and so I may just have to suggest a pizza grilling party. How fun!! I can't watch the video now, since everyone is asleep... but I'll be back:). 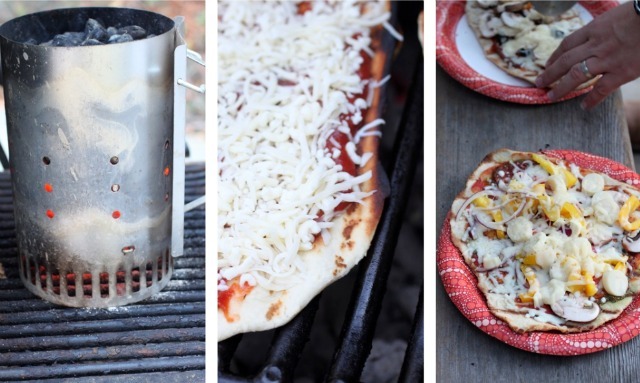 We love grilled pizza- and it is a perfect way to entertain (mess-free). I'd say- go with the muffin cups; even though I love the cast iron skillet idea too... muffin cups are more fun:). I definitely want to try that now. Fun video :) your kids are adorable and that song is perfect! thanks for sharing a new twist on pizza! glad you gals liked the video. The kids are fun specially when they get to eat pizza with their friends. We've never tried grilled pizza, it looks awesome! David- it wouldn't stick. It's weird but it doesn't really stick. Just oil up your grill. ok first things first. i need to buy my hubby one of those circle fire starting things...he can't start our BBQ and i am IMPATIENT. with that said - i wanna live in your community...ours is BORING. I do love our community and our big shared backyard and the fact that we're all poor students. It's pretty awesome. That fire starting thing is crucial, I've learned. This is the first time that I have heard of grilled pizza. What a wonderful concept! I was just wondering about what I should make for dinner tomorrow night. Now I have a plan. Thanks! So funny. I had friends over on the 13th for BBQd pizza. It was my first time, it's such an easy BBQ and get together idea! Will definitely do it again and a lot more next summer. Mada, I wish I had discovered grilled pizzas during the summer. I would of made it way more.